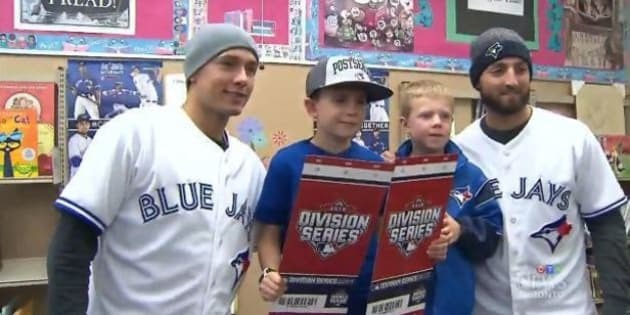 On Monday, a 9-year-old Etobicoke, Ontario, boy, who previously lost his dad, was surprised by two of his heroes at school: Toronto Blue Jays players Ryan Goins and Kevin Pillar. Jack Blunt, a grade four student at Warren Park Public School, lost his father when he was just a kindergartener and last year, he was diagnosed with diabetes. As a result, baseball and the Blue Jays have helped him cope. “One of the biggest things for him has been staying involved with athletics — running and playing and living and breathing baseball,” his mom Jenn told CP24. On Monday afternoon, Jays’ players Goins and Pillar not only surprised Blunt at his school, but presented him with hats, shirts and four tickets to the Jays’ first post-season game on Thursday.